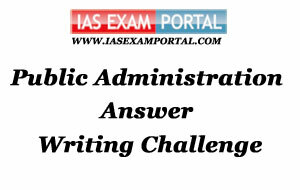 Weekly Mains Exam 2016 Answer Writing Challenge - Public Administration "MODULE- 59" | IAS EXAM PORTAL - India's Largest Community for UPSC Exam Aspirants. Weekly Mains Exam 2016 Answer Writing Challenge - Public Administration "MODULE- 59"
Public Administration- Paper I "Syllabus Topic – Administrative Behaviour : Theories of Leadership"
Q1. Do you think Leaders are vision creators ? Give your answer. Indian Administration- Paper II "Syllabus Topic –State Government & Administration: Union-State Administrative, Legislative and Financial Relations"
Q2. One' of the greatest weakness inherent in a Federal polity is the possibility of conflict of loyalty and responsibility on the part of public servants as between Central and State Governments." - Elaborate and comment. Public Servants are appointed through a Central Recruitment process and are accountable to the Department of Personnel and Training under Ministry of Personnel, Public grievances and pensions. Even though the State Government is responsible for transfers and disciplinary actions, yet it is observed that in the case of an ensuing conflict over the job description or duties of a public servant, the mandate of the Central Ministry that has appointed the public servant and is the only authority that can dismiss him/her in case of breach of code of conduct, will prevail. The conditions of the service are regulated by rules and regulations under the Government of India and hence their loyalty vests with them. Also the civil servants are considered officers in passing, since they are allotted cadres depending upon the demands of the development and hence do not have ownership for the cause as much a local person would have. This limits their degree of responsibility and loyalty to the State level administration despite being representatives of the central Government to aid the State administration in delivery of development. Another instance can be where a public servant is more interested in professional gains while at service and since the mandate of transfers, postings and disciplinary action vests with the State Government, the public servant will try to appease his political master to ensure his/her continuity to good posts while in the service. Both are challenges in the process of administration and hence Civil Services Reforms backed by a concrete law must be introduced that brings neutrality to the transfer, posting and other such benefits that accrue to the public servants and make them more committed to the process of development.